» Pucallpa is in the Amazonian rain forest of eastern Peru, located on the banks of the Ucayali River, a major tributary of the Amazon River. The best way to get to Pucallpa is to fly. You can take a one hour flight on one of Peru’s national airlines – Star Peru or LAN. 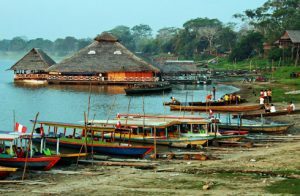 » Pucallpa boasts very little tourism although there are various native villages and places of interest nearby. Many shanty towns have sprung up in and around the city, and countless motokars (a motorcycle with a small buggy attached) and taxis make the roadways buzz with activity. » AMOR Projects has two sites, one located near the city of Pucallpa and the other further out. » The site known as “Km38” is 38 kilometers from the city of Pucallpa (hence the name). AMOR Projects has 247 acres of land located at Km38. This site is used for farming and agricultural development. The main crop is cacao, yucca, mangos, and pineapple. Animals resident at Km38 are horses and many cattle. » Km38 is based in the district of Campo Verde, population of 19,696. Campo Verde comprises part of Province Coronel Portillo, which is included in the Department Ucayali. » The site know as “Km8” is 8 kilometers from the city of Pucallpa. At this site, most of the medical outreach is accomplished. AMOR Projects has a clinic at this location. The clinic can handle many facets of medicine; dental, medical, eye care, and contains a pharmacy. Most of AMOR Project staff and student missionaries are located at Km8. » All Peru travel centers in Lima, Peru’s capital city. All international flights make their first stop here for customs and immigration. » Travel from Lima to Pucallpa is available by ground or by air. Ground transportation by public bus takes approximately 20 hours to cover 864 kilometers and crosses the Andes mountain range. Air travel entails a 60 minute flight. » Transportation around the AMOR Projects sites are available by taxi and motokar. » Pucallpa is located in the low jungle region of Peru’s Amazon basin. Elevation is approximately 486 feet (148 meters) above sea level. The region boasts a hot and humid tropical climate with temperatures averaging between 70-90 degrees F.
» There are two seasons: rainy season and dry season, although rain is present year-round. Rainy season traditionally falls between November and March and Pucallpa receives approximately 120 inches of rain per year. During rainy season, daily showers are a regular occurrence. Rain storms can last all day or be as quick as a half-hour downpour.